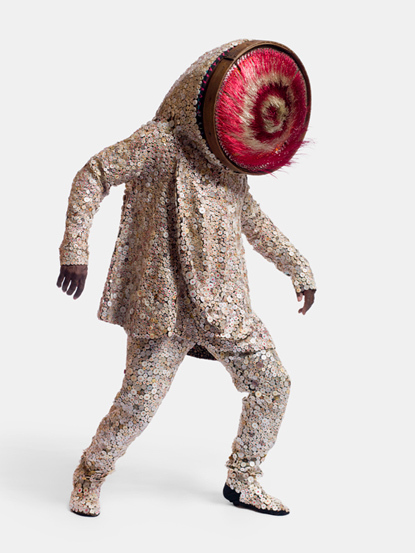 Nick Cave is a “trans-artist” who works in fabric, sculpture, dance and performance art. He builds and performs in “soundsuits” made of twigs, dyed human hair, sisal, plastic buttons, beads, sequins, feathers found knitwear. He also exhibits them as sculptures. He is the chair of the Fashion Department at the School of the Art Institute in Chicago. He went to Kansas City Art Institute and Cranbrook, and studied with Alvin Ailey. Of his work, he says, “I personally am working toward what I am leaving behind.” Here you can see a nice gallery of his work and there are some great videos on Youtube.